– Created by Connecticut Public Television. 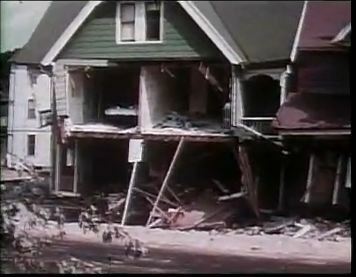 “The Flood of 1955” is excerpted from the program, When Disaster Struck Connecticut, and is part of a collection of CPTV original documentaries. “Finding Aid to Floods and Hurricanes in Connecticut - Inventory of Photographs - PG 160.” Connecticut State Library, 2017. Link. Western Connecticut’s Great Flood Disaster, August 19, 1955. Waterbury, CT: Waterbury Republican-American, 1955.